Seguin City Hall is located at 205 North River Street, Seguin, TX 78155; phone: 830-379-3212. Photo: Sebastopol House, ca. 1855, 704 Zorn Street, Seguin, TX. The house was built of concrete by Joshua W. Young for his sister, Catherine LeGette. Listed on the National Register of Historic Places in 1970. Photographed by User:Larry D. Moore (own work), 2008, [cc-by-3.0 (creativecommons.org/licenses/by/3.0)], via Wikimedia Commons, accessed March, 2015. 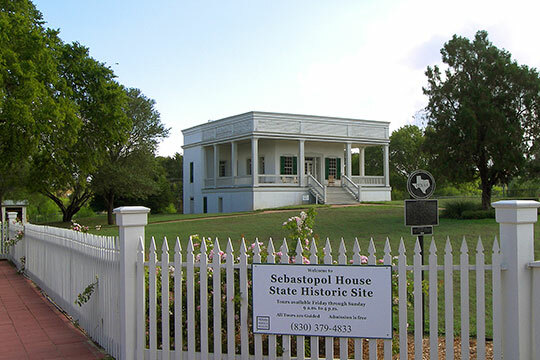 The heart and soul of Seguin lies in its close association with the personalities that founded Texas, as well as its history of regional political significance. The landscape afforded a fertile landscape that encouraged Seguin's agrarian economy, and Seguin held added significance as County Seat for Guadalupe County. This began a history of distinction that set Seguin on a different (and more urban) path than its neighboring rural townships. Selection of Seguin as the Governmental Seat for a newly created Guadalupe County occurred for the same reasons that Seguin would, from that moment forward, draw attention as a place to gather traffic, people, and products from the surrounding landscape. A certain amount of commercial enterprise could also be supported by the traffic demand incurred by this jurisdictional function. Seguin's landscape lies in the "Texan" Ecological Province, encompassing two important vegetative regions within the State. These regions are the Texas Blackland Prairie and the East Central Texas Oak Woods. The confluence of these two regions at Seguin provided a rich agricultural resource that offered fertile soil and thick forest. Therefore, crops and timber became early economic underpinnings of a new and growing City. The early town plan, which is described below, provided designation for both of these agricultural activities. Seguin sits on a blackland bluff overlooking the Guadalupe River floodplain at a point where flat land (associated with blackland soils) breaks into more steeply sloped land (associated with more acidic soils), and where water might be quickly lifted up to supply a spring (such as Walnut Spring). Seguin's site offered the new settlement certain benefits in its location not easily found in this open land. The founders of Seguin acquired this specific site not only for its many attributes, but also for its unique beauty, which is referenced by the visitors and settlers who made their way to Walnut Spring. These comments are well documented in the writings and notes of those first 33 shareholders in the Corporation that established Seguin's original town plan. The era of Seguin's founding was also the era of a more general westward expansion by European immigrants flowing from the eastern United States. Many of these settlers came to Texas following the opening of Mexican Territory to general settlement (1822). The visions of land and a better life that inspired families to endure the trials of frontier settlement consumed the consciousness of a young nation, giving rise to many visionaries and utopian thinkers in pursuit of the ideal city. Some of these experiments found their way into the mid-west (places such as New Harmony by Robert Owen and Oneida or Amana), while others became the frontier model for settlers trying to civilize a hostile land (such as the Plat of Zion imposed by early Mormons in Utah and along the Virgin River Valley of Nevada). Therefore, it is not surprising that the first settlement of Seguin (then called Walnut Springs) was accompanied by a visionary plan that set in place a template for the city's future and provides background by which the planning issues of today can be understood. However, early in its history, downtown's place as a hub within the patterns of local and regional movement was weakened by a shifting of traffic to newer corridors which passed outside the core instead of through it. As the City matured and grew, traffic densities were continually shifted to newer throughways, which moved increasingly further from the core area. Each new major throughway precipitated a wave of commercial investment and residential growth, which would collectively constitute the form of the City at that time. Every time that traffic and infrastructure shifted, the dominance of Seguin's central core was challenged. The City Form, which was once highly legible, became harder to comprehend. This is the greatest issue facing the City at this moment in its history, as these trends, should they continue, will further convolute the form of the city. The City's present form reflects these conflicts that assault and weaken its historic center. City of Seguin Texas and the Mesa Design Group, The Seguin Comprehensive Master Plan, 2008, www.seguintexas.gov, accessed May, 2015.